For as long as I can remember I've been fascinated by the way farming used to be done. 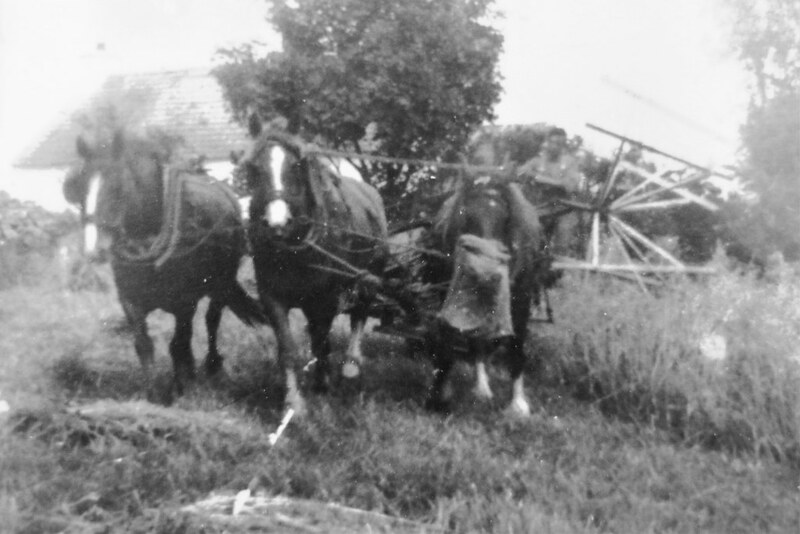 The bygone days when the horse was the farmer's constant companion (along with his dog, obviously). 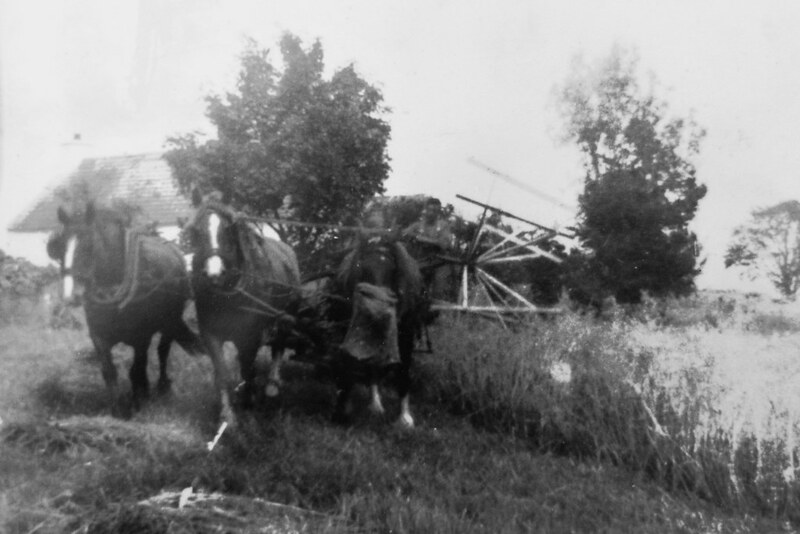 In my house hangs this photograph of my grandfather driving three horses while operating a binder. They are harvesting corn - you can see the straw on the ground in front of the horse on the left. The smaller horse on the right is a mare who was notorious for eating the corn while she was working - hence the bag over her nose. The other two are stallions/geldings. It was very unusual at this time for a farm to have more than two horses, as is the case here. One of these was borrowed from a relative for the harvest. The photograph was taken by persons unknown in the late 40s/early 50s, a time when a scene such as this was nothing extraordinary. Unfortunately my grandad passed away before I was born, but it would be amazing to have just one conversation with him. But I am so pleased I have this photograph of my grandad doing the work he loved. To me, far more valuable than a posed photograph of him in his Sunday best. Love your photo. Very cool. What a cool photo! I'm also fascinated by the ways that animals and humans formed teams to get jobs done. Thanks for sharing! That's so neat! 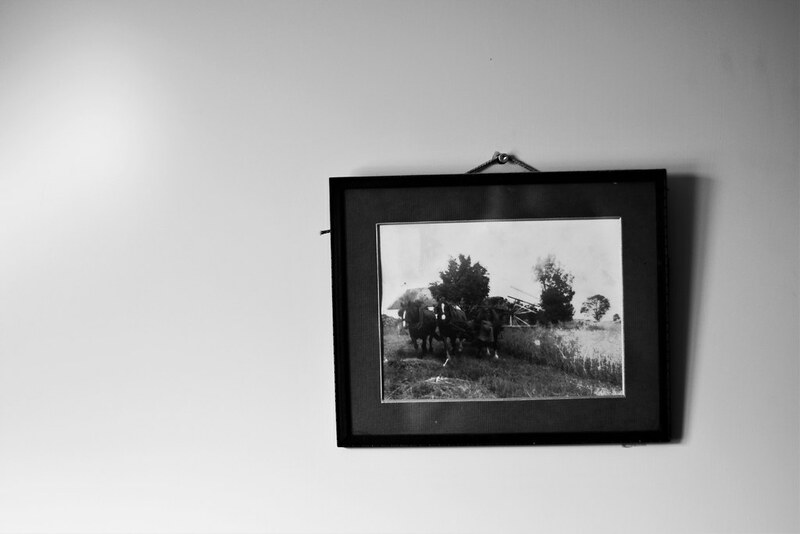 There's a photo in my mom's house of my great great grandfather using his mule to plow. I love it. What a wonderful picture memory to have. These are such cool photos. I would be like that small mare who was eating on the job! Wow! Love it! My fave old BnW photograph for my family is a picnic at a local waterfall, with everyone sitting on a large rock in what look like very stiff and uncomfortable outfits for a picnic, and with the two family dogs of the time with them, of course! My fave BnW of my husband's is his great grandma at one of the strike kitchens in a small Scottish town, with her sleeves rolled up, serving food to the striking miners. She looks just as strong and capable as her great grandson!